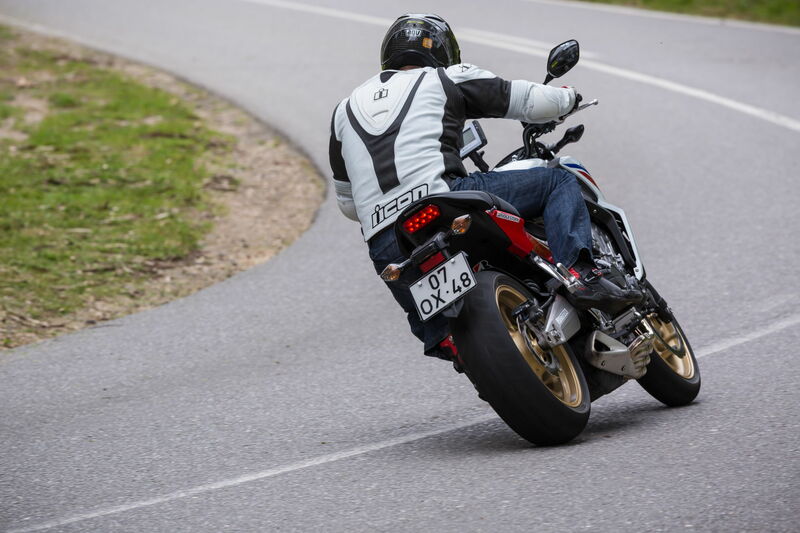 ‘Comfortable performance’ was the aim with the new Bridgestone T30 EVO tyre. Bridgestone users asked for rubber that could cope with the demands of sporty touring in wet and dry conditions, a lot to ask of any tyre, I’m sure you’ll agree. 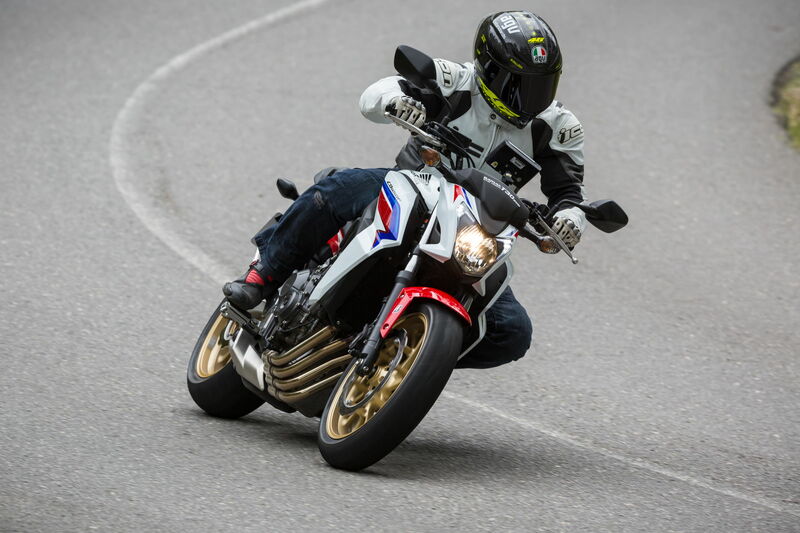 With those parameters in mind, if you’re looking for a sticky tyre to sling in your sports bike before the summer kicks off, then you might be better off looking a little higher up the Battlax food chain. If day-to-day commuting and year round big mileage trips are your thing then you could do a lot worse than try a set of these. 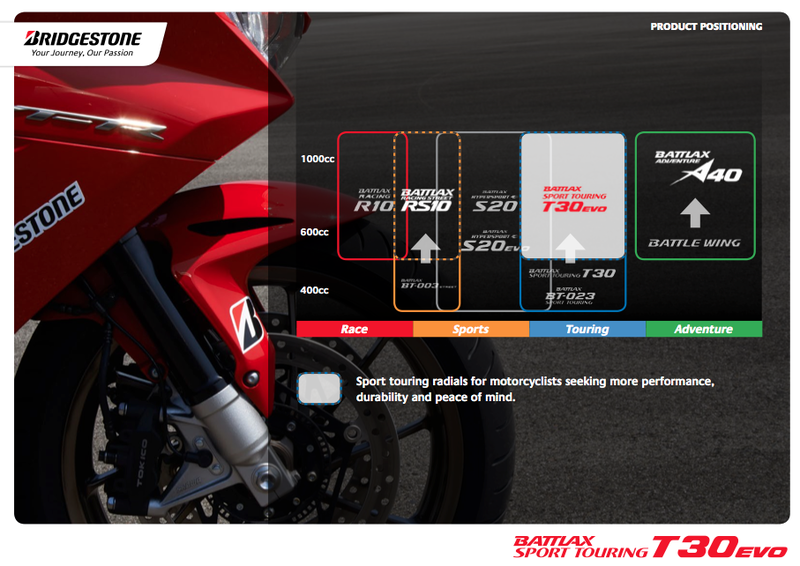 T30 EVO sits to the right of the Battlax line up. 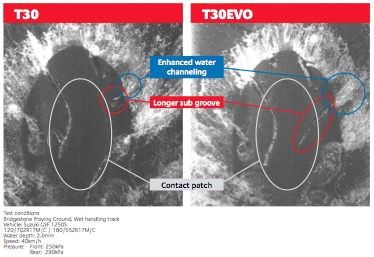 Bridgestone wanted to maintain the already proven dry weather performance of the existing T30, but with improvements in wet weather handling, this was achieved using two methods. The first was a new formula compound and the second was an improved groove pattern, one that does a better job of channeling water away from the contact patch. Larger contact patch means more chance of grip in the wet. 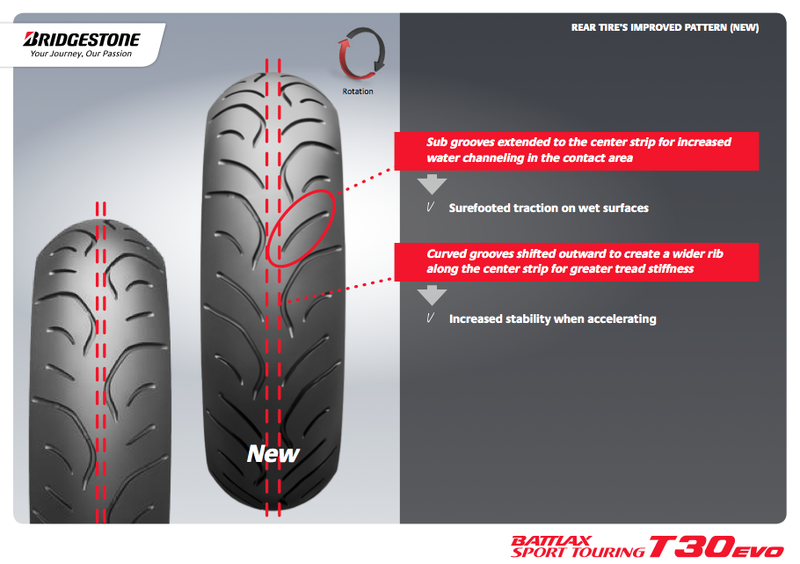 Lengthening the grooves that run to the centre of the tyre not only increases their ability to channel standing water away from the contact patch, but the contact patch itself has also increased in size slightly, giving more stability, more grip and increased rider confidence. The new compound developed has been used in the centre section of the rear tyre (the front is a single compound) and the aim is that it’ll provide the same amount of grip as the old T30 at a lower temperature, and increased levels of grip at a higher working temperature. It’s clever stuff. We grabbed our chance to head out and see what these improvements felt like on reasonable to poor surfaced roads in Southern Portugal. The conditions were dry, so the wet weather performance remains unproven, based on my experience with Bridgestones over the last ten years, I’m happy to give them the benefit of my doubt. I started the ride on a Honda CB650F, which was dull as dishwater by the way. Bike aside, the roads were relatively fast. Flowing and with the odd blind hairpin, but pretty fast all the same. 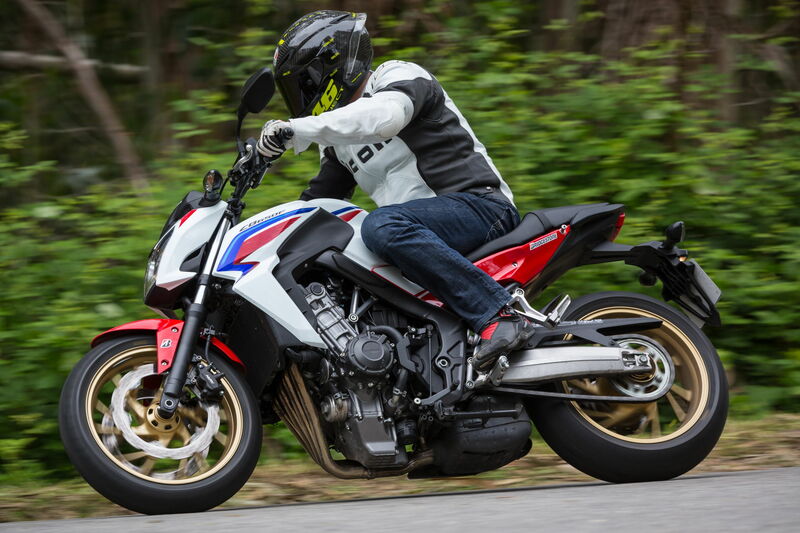 The Honda felt completely stable in a straight line, comfortable and not harsh in any way. A friend riding a Yamaha Tracer was getting himself into all kinds of trouble with weave and headshake (a feature we know doesn’t exist on the oe Michelins), but this was at 100+mph speeds. Turn in felt stable, not too fast and with no real effort required. The tyre tracked a line in a corner really well, even when I experimented by adding small amounts of brake (either end and combined) the bike didn’t want to stand up straight away and run to the outside of the corner. One thing the lamo Honda 650 kept doing was not having enough gear to accelerate properly off the corners. After a reasonably fast turn in, if I had to scrub any speed mid corner, I was left in too high a gear to get good drive on the way out, forcing me to change down a gear or two. This is the kind of move that can upset the balance of a bike, particularly when riding down blind roads. The whole time the Bridgestone behaved really well, I’d have no problem at all recommending them to anyone. I did have one moment, but it was one that I’d have had on any tyre, an unavoidable rock the size of a healthy hamster in the middle of a corner caused me to create all kinds of shapes to avoid it. I clipped it with the rear tyre, which unsettled the bike. I’m sure I would have managed the same freestyle avoidance technique on a competitor tyre, but I can certainly vouch for the T30 EVO’s ability to change direction and brake without giving the rider anything else to scream about. Later in the day I managed to grab the keys for something a bit more substantial and found myself bowling along on that fancy looking new Yamaha XJR 1300. A completely different bike to the little Honda, weighing 240 kilos ready to ride and with around a 100bhp, the riding game changed completely. I now had enough torque to haul myself out of corners, but found the mass of the bike needed a fair shove to get it to settle into a corner. Long sweeping bends were a doddle, it was the tight and twisty stuff that was a challenge. All the while the T30 EVO was completely compliant. Even when we turned up the pace and chased the lead rider (some guy called Freddie Spencer), it was me that called time on the pace before the tyre. Confident and sure footed, the T30 EVO is a solid all round option. Despite not getting the chance to test the wet weather ability of the T30 EVO, there’s little to complain about. Like I said at the beginning, if you’re a track day guy or you spend your life sniffing out knee down road riding, you’re probably better off looking at the S20, but if you’re an everyday rider with big mileage intentions, check the T30 EVO out. Price: Expect to pay around £250 a pair.